After Dan Curtis changed launched an American pop culture phenomenon with his dark, Gothic daytime TV series and quasi soap opera Dark Shadows in 1966, there was a sudden spike in interest for small screen horror that rolled on strong for over a decade. And while it was Curtis who made the most potent post-Shadows mark with his terrifying and visionary TV terror films like Dracula, The Night Stalker. The Norliss Tapes and Trilogy of Terror, many other savvy producers also jumped on the spooky bandwagon, delivering gritty, star-studded and serious-in-tone movie-of-the-week shockers that oozed atmosphere, mystery and menace. And while never intended to be high art, seen from the distance of time, the 70’s TV horror movie is a genre entertainment like no other, one that used the same post-code Hollywood approach of showing and exploring darker themes in creative ways without revealing too much and upsetting the sponsors, to elegant effect. Among those incredible TV-tailored horror gems sits director Daniel Petrie’s Moon of the Wolf, a tight and eerie Southern Gothic creeper with an ace cast, a fun and engaging central mystery and compact, crackerjack storytelling. Originally broadcast on ABC on September 26, 1972, the film was repeated ad nauseum on prime time and then, eventually, late night, post-11pm news screenings, the latter which has made it a fan favorite. Long lapsed into the public domain, Moon of the Wolf is an easy picture to find and watch (tip: it’s on YouTube) and because of its easy accessibility, it’s rarely remembered as a good film, if it’s remembered at all. It certainly needs more love. Moon of the Wolf (reportedly faithfully adapted from the Leslie H, Whitten novel) stars The Fugitive himself, David Janssen as Sheriff Whitaker, a no-nonsense Louisiana lawman who prowls the Bayou righting wrongs. When a girl is found in the swamp with her head bashed in, Whitaker becomes involved, sifting through a rogues gallery of sketchy locales (including Salem’s Lot’s Geoffrey Lewis) and eyeballing ultra rich tycoon Andrew Rodanthe (played by genre veteran and Bug star Bradford Dillman). Meanwhile, the victim’s father (Paul R. DeVille) spends his days in a daze and babbles in French, warning of the horror of the “loo-ka-roo”. And while Whitaker is initially confounded as to the meaning of old man’s blatherings, after more and more locals get murdered and torn to shreds, he soon realizes that “loo-ka-roo” is actually “loup garou”…y’know, French for…werewolf! Blending a swampy, lurid Gothic melodrama with a traditional, Universal Pictures-esque horror/tragedy, Moon of the Wolf is a terrific little film. Outside of the reliable presences of the aforementioned solid leads, Messiah of Evil and House II’s legendary character actor Royal Dano also shows up and does what he does best; the sense of mist-soaked, sweaty location is palpable and the entire thing is gelled together by an intense, moody score by pianist and composer Bernardo Segall. The And at 75 minutes, the movie just breezes by, interrupted only by comforting fade-ins and outs where the original commercial breaks were scheduled to be. 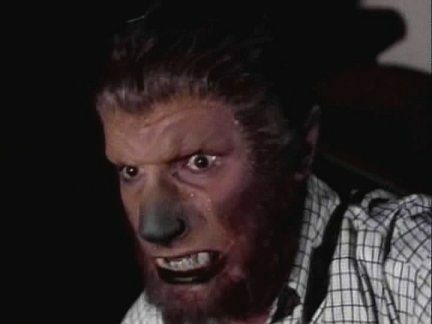 And of special note is the classy, retro-looking werewolf make-up designs, helmed by none other than William Tuttle, the veteran artist who was responsible for virtually all of the creatures and mutants in TV’s The Twilight Zone. 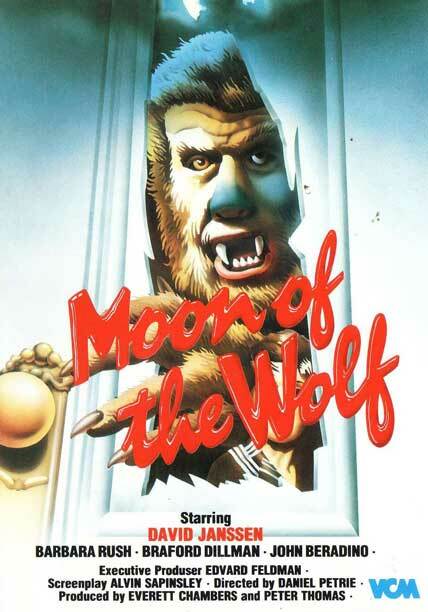 Moon of the Wolf is in no way a “so bad its good” film as some sniggering critics have dismissed it as. It’s a good film, period. And oddly, with its central mystery and suggestion that lycanthropy is hereditary, there are some links – accidental or otherwise – to Joe Johnston’s recent remake of The Wolfman. Give this one a spin, late at night. It’s a piece of a larger cinematic puzzle from a less complicated time that this writer misses dearly.